Summer is the perfect time to turn up the heat on your fitness goals. The temperatures are high and so is your motivation, leaving you free to make hay while the sun shines. And while the increased temperatures can present unique challenges to those seeking the perfect summer body, achieving your summer fitness goals can be fun and incredibly rewarding if you just follow a few simple tips. 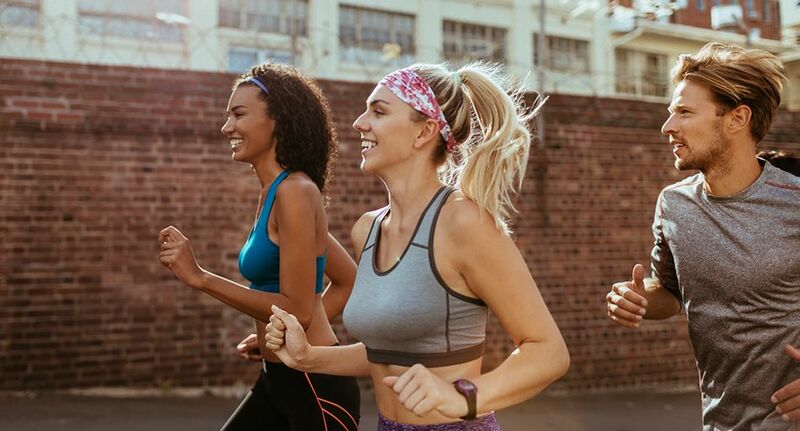 So, to assist you on your quest to become a healthier you, we’ve compiled 7 summer fitness tips that will help you beat the heat and have plenty of fun in the sun while working out this summer! To stay sun smart while exercising this summer, make sure you also read our sun safety facts. First things first, it is imperative that you stay hydrated while working out during the summer. At the risk of stating the obvious, temperatures are higher during summer, meaning you’re likely to sweat more while exercising. As such, you need to drink water consistently to replenish your fluids and avoid dehydration. It’s important to note that you shouldn’t necessarily wait until you’re thirsty to drink water. As your body has to work extra hard to regulate your temperature in the summer, dehydration can sneak up on you, leading to fatigue and a poorer workout. Instead, try to hydrate at regular intervals by drinking 1-2 glasses of water prior to your workout and having a water bottle on hand throughout. For more fun and delicious hydration tips, click here to learn how to pimp up a glass of water. When the sun is beating down and you’re sweating up a storm, exercise can start to feel like a real chore. While staying fit throughout the hot summer months can be hugely rewarding, you also need to be conscious of when you’re working out. Rather than trying to set a new personal best at two in the afternoon, try to strategically plan your workouts to avoid the hottest parts of the day. Typically, in summer, this will be from 11am-3pm. This way, you can still smash your summer fitness goals without suffering in the scorching heat! Exercise isn’t usually a fashion contest. Most of the time, some sweat-resistant clothing and a sturdy pair of sneakers will be enough to get the job done. However, there are a few handy clothing tips you should follow to give yourself the best chance of surviving the heat and achieving your summer fitness goals. First of all, ditch black clothing. While it might be slimming, it also attracts heat, and you’ll have more than enough of that to contend with already. Secondly, ditch tight-fitting clothes in favour of looser, more breathable clothing. Not only will this help you achieve your summer fitness goals, but you’ll look great doing it! While it might seem strange to shower before your workout, a well-timed cold shower can lower your core temperature, skin temperature, and heart rate, leaving you refreshed and ready to tackle that sweltering summer heat. In fact, studies have shown that taking a cold shower before exercising in the heat can improve the quality of your workout. Alternatively, if you’re not a fan of cold showers, a well-placed ice pack on the back of your neck can have the same impact. Either way, if you’re the type of person who’s already sweating before you’ve even stepped out the door, then a nice, cold shower might be just what you need to kick-start your summer fitness. If you’re looking for other ways to cool down before your workout, check out our tips for staying cool in summer without air conditioning. If you find the summer heat is draining your energy and making your regular workout routine impossible to complete, then don’t be discouraged, because that just means this is the perfect opportunity to try something new! This might mean shaking up your fitness routine with shorter, HIIT style workouts, or even a nice, refreshing swim to avoid the heat. Summer is also the perfect time to incorporate yoga into your daily routine, as higher body temperatures increase your flexibility, allowing you to go deeper into certain poses. They say variety is the spice of life, so why not inject a little spice into your workouts this summer? While protein shakes and bars are a staple of many pre-workout diets, you might want to consider ditching them during the summer. Research has found that consuming high levels of protein prior to working out can elevate your basal temperature. Obviously, when it’s already scorching hot outside, the last thing you want is to feel even hotter. Instead, save the protein for after your workout, and substitute it for something cold and refreshing beforehand! We’ve all been there: scurrying barefoot along a footpath that has been baking in the sun all day long. It feels like lava, and you’re concerned your feet are about to melt off. When exercising in summer, it’s best to avoid asphalt and concrete footpaths altogether, as they heat up quickly and reflect the sun’s rays. Instead, try to work out on surfaces made from dirt, gravel, grass, or, best of all, sand. Not only does the sensation of sand between your toes feel incredibly satisfying on a hot summer’s day, but working out on sand forces you to engage more muscle groups, leading to a more effective workout!